When you're getting paid to kiss someone on camera, it helps if you also enjoy kissing that someone in real life too. These television couples mixed business with pleasure to varying degrees of success. Sara Gilbert and Johnny Galecki dated in real life at the same time they played teen couple Darlene and David on Roseanne in the early 90s. "I thought he was super cute and I had a total crush on him," Gilbert said on The Talk (via the New York Daily News) in 2013. "And we started dating and he would come over and we would, like, make out, and then I would start to get depressed." Eventually, she came out, but cleared it with Galecki first. "I called him and I just said, 'Is it okay–I'm thinking of talking about this. The story sort of starts with you. And I've got to say I made out with you and got depressed, which is kind of a bummer." Thankfully, Galecki was a good sport. "[He said], 'Of course. I love you and I think it's really important and I'm so proud of you…If you want, I will be there and I will hold your hand.' It was so sweet, and this story really makes Johnny look good." Lenny and Penny forever! 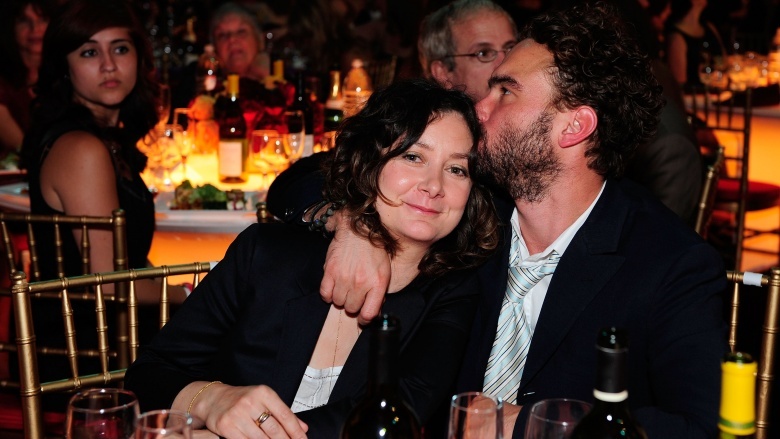 Gilbert isn't the only co-star Galecki has romanced. 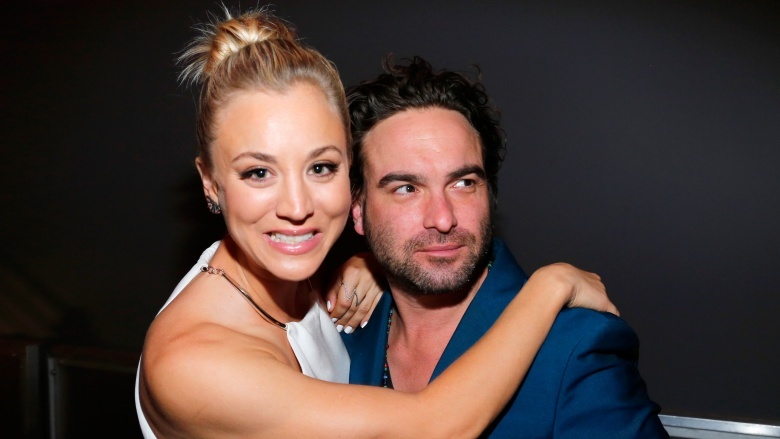 Galecki also dated Kaley Cuoco, who was then his on-screen girlfriend and now his on-screen wife on The Big Bang Theory. The couple kept their relationship a secret during the two years they were together, and the world didn't find out until they'd already split in 2010. Galecki explained to CBS Watch! magazine, "I just don't like to speak about it. And not because I'm trying to be enigmatic; I just worry that it will conflict with people's acceptance of Leonard and Penny." Jennifer Garner played Scott Foley's on-screen girlfriend in Felicity, and she was his off-screen wife briefly, too. People reports the pair married in 2000 and divorced in 2003, around the time she met Ben Affleck. Foley told TV Guide the breakup was nobody's fault. "Jennifer became a huge celebrity. She became a huge star, and she deserved everything she got. There was no other relationship, there was no infidelity, nothing. People get divorced, you know? Through no one's fault and everyone's fault." Keri Russell and Scott Speedman dated during the later half of Felicity's run. He even admitted to grabbing breakfast with her at 6:30 am after their sleepovers! Keri Russell and Matthew Rhys play a KGB-set up couple on The Americans, but it didn't take any government intervention to get them together in real life. The couple hooked up in 2013 and are now expecting their first baby. Nina Dobrev and Ian Somerhalder played star-crossed lovers Elena and Damon in The Vampire Diaries, and their relationship extended into real life. They dated for more than three years, but Life & Style reports their 10-year age gap ultimately led to their split in 2013. Somerhalder reportedly wanted to settle down and get married, while at just 24, Dobrev wasn't ready for that level of commitment. House stars Jennifer Morrison and Jesse Spencer shacked up and broke up both on and off screen. People reports that the real-life couple called off their engagement in 2007, but continued to play an item on the show until their respective exits from the series. Zac Efron and Vanessa Hudgens starred as a teen dream couple in Disney's High School Musical (2006) TV movie, and their romance extended into real life too. The on=screen Troy Bolton and Gabriella Montez stayed together for the two subsequent sequels, but split in 2010. Hudgens and Efron didn't last much longer than their characters. Hudgens told Shape their conflicting schedules contributed to the breakup once they stopped filming together constantly. "Long distance relationships are hard no matter what," she said. But there's no bitterness. She added, "We grew up together. It was nice to have someone to share all those experiences with." Lea Michele and Cory Monteith dated on Glee as Rachel Berry and Finn Hudson (affectionately dubbed "Finchel") and in real life from 2010 until his tragic death from a heroin overdose in July 2013. Sophia Bush and Chad Michael Murray began dating while co-starring on One Tree Hill in 2003 and even tied the knot in 2005. Unfortunately, the union was short-lived. They filed for an annulment only five months later amid rumors that he'd cheated on her with Paris Hilton while filming House Of Wax (2005). Dawson's Creek co-stars Katie Holmes and Joshua Jackson dated during the series' run in 1998. Holmes even revealed that Jackson was her "first love." After their breakup, Holmes felt nothing but warm fuzzies toward her old flame. She told Rolling Stone (via Us Weekly) "I feel so fortunate because he's now one of my best friends. It's weird, it's almost like a Dawson-and-Joey type thing now." Joe Jonas and Demi Lovato co-starred in Camp Rock (2008) and Camp Rock 2: The Final Jam (2010), and their brief yet tumultuous romance behind-the-scenes was probably more dramatic than either TV movie ever could be. They dated right around the time the sequel was set to hit the Disney Channel and broke up only months later. 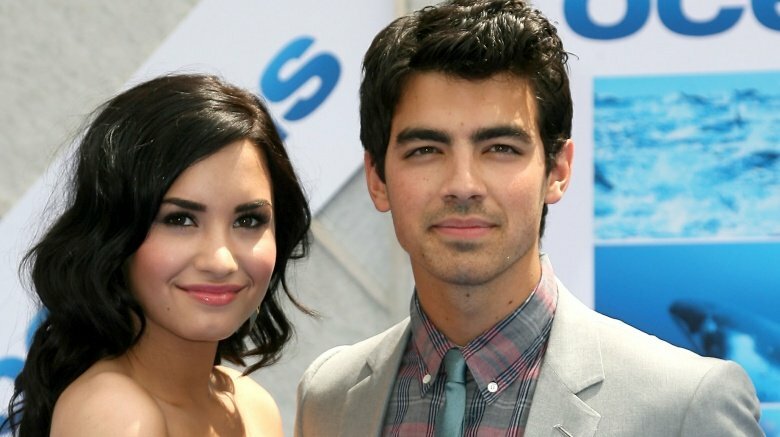 Jonas told Us Weekly, "Demi and I knew going into our romantic relationship that it may not be an easy one. I realize over the time we have shared together that I feel I care more about our friendship right now. It was my choice to breakup, but I love her as a friend. She's been there for me when I needed her. I will continue to be her friend and be there for her." Except, well, he wasn't. 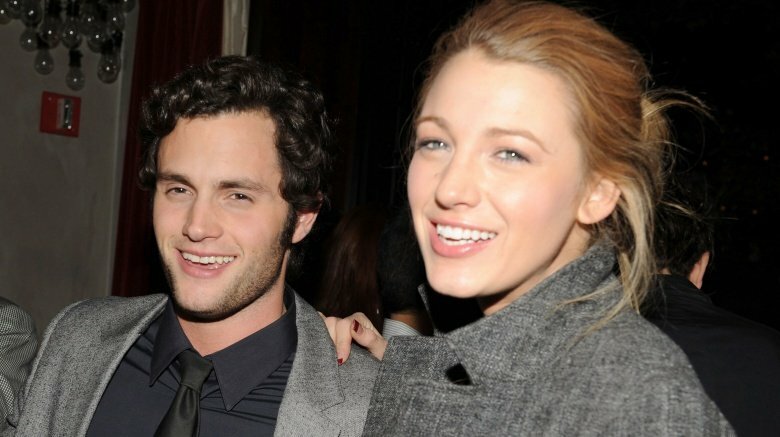 Blake Lively, who starred as Serena Van Der Woodsen in Gossip Girl, dated her off-and-on-screen boyfriend, Penn Badgley (Dan Humphrey), from 2007 to 2010. They continued to play a couple on-screen until the series ended in 2012, but neither one of them is bitter: Badgley actually told Us Weekly that Lively was his best on-screen kiss ever "because they were in a real relationship at the time." Alexis Bledel's Rory Gilmore fell for Milo Ventimiglia's bad boy Jess Mariano on and off screen. People reports that the couple dated for three and a half years from 2002 to 2006 and had even talked about marriage. The pair will soon reunite (maybe!) on the Gilmore Girls reboot. 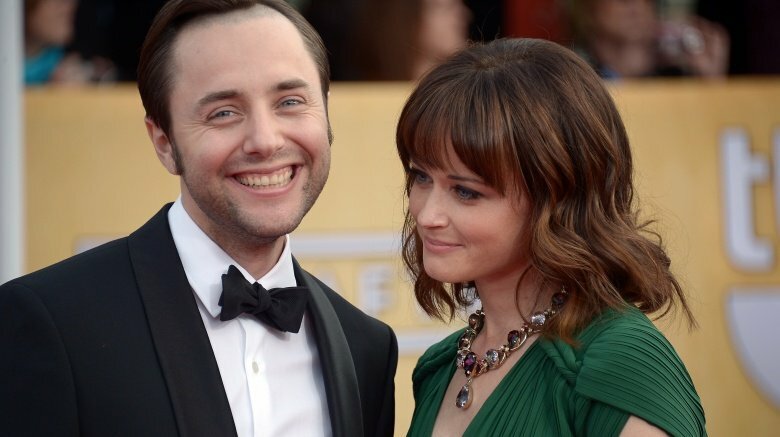 Alexis Bledel moved on from Ventimiglia with another co-star: Mad Men's Vincent Kartheiser. In 2012, Bledel guest-starred on the series as a mistress to Kartheiser's Pete Campbell. Kartheiser told New York magazine that he kept it "completely professional" on set and that nothing really happened until after the season wrapped, but co-star Jon Hamm told Vulture, "I did know he liked her from a very early point. I was supportive of that union." The pair went on to marry and had a baby boy in May 2016. Jamie-Lynn Sigler and Jerry Ferrara dated on Entourage and in real life. They were a hot item from October 2008 to December 2009 but generally kept the relationship under wraps. Mila Kunis and Ashton Kutcher played the adorably obnoxious couple Jackie and Kelso on That '70s Show. While no romance brewed on set (in fact, Radar Online reports they couldn't stand each other at the time), they eventually went on to tie the knot and now have a baby girl and another tyke on the way. 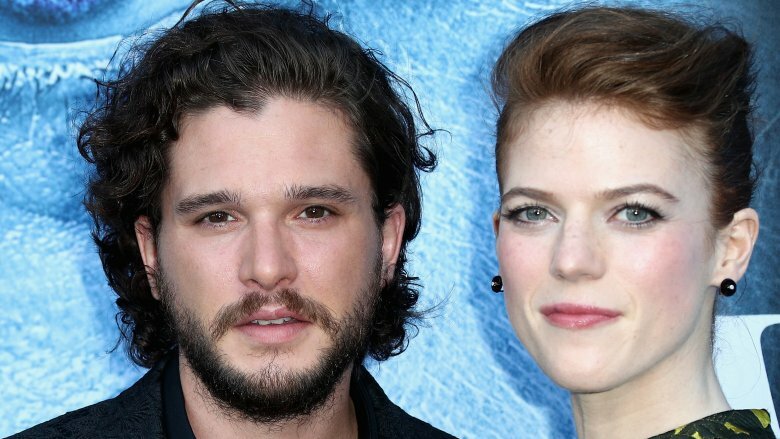 Kit Harington and Rose Leslie were an item on screen as Jon Snow and Ygritte on Game of Thrones (2011-) before taking their real-life romance off the set. 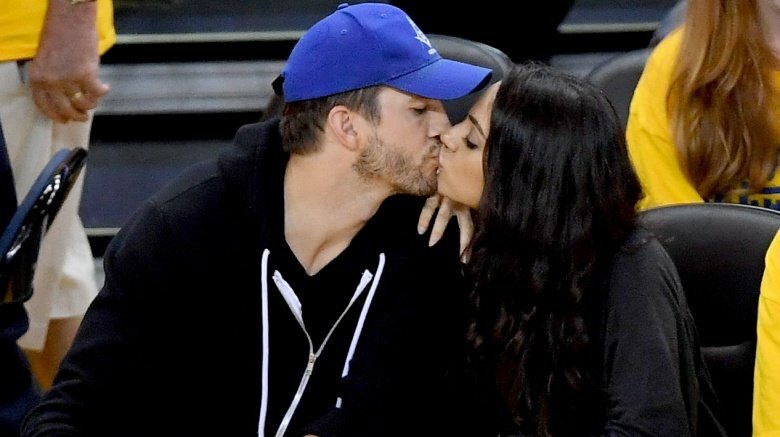 TMZ first reported on the pair's potential off-screen coupling in the summer of 2012, and they clearly went the distance: People reported in September 2017 that the couple was engaged. Though Leslie has been quiet about the romance, Harington gushed to L'Uomo Vogue (via People) that shooting scenes with her in Iceland were his favorite moments of the entire series "because the country is beautiful, because the Northern Lights are magical, and because it was there that I fell in love. If you're already attracted to someone, and then they play your love interest in the show, it becomes very easy to fall in love." 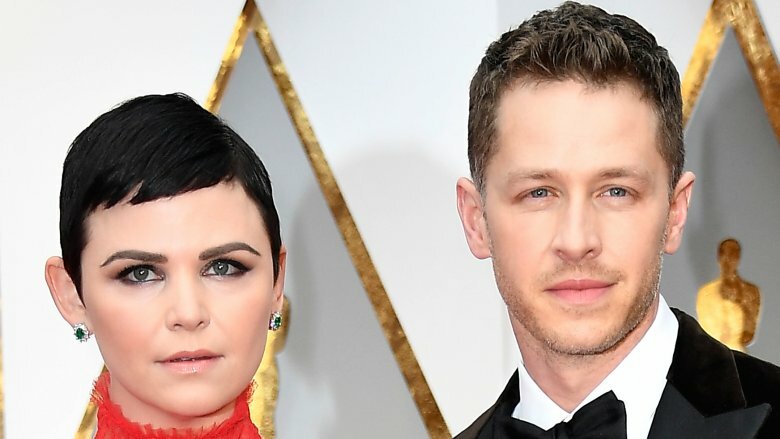 Josh Dallas played the Prince Charming to Ginnifer Goodwin's Snow White on Once Upon a Time (2011-), and he turned out to be her real life knight in shining armor, too. The co-stars reportedly had an "immediate connection" when they met in 2011 and tied the knot in April 2014, E! News reported. They're now parents to two boys, which should keep them occupied, since they both left the series in the spring of 2017. 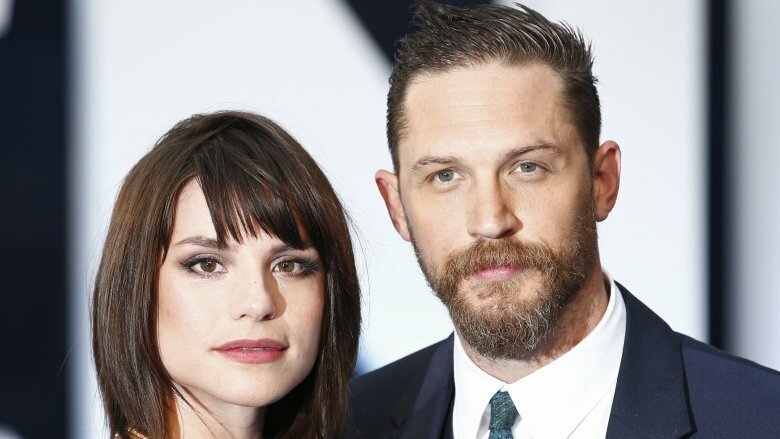 Tom Hardy and Charlotte Riley's relationship as Catherine and Heathcliff was doomed in 2009's TV series of Wuthering Heights, but their real-life romance has a much happier ending: The Sun reported that after dating for five years, Hardy and Riley married in July 2014. They welcomed their first child, son Louis, in October 2015. 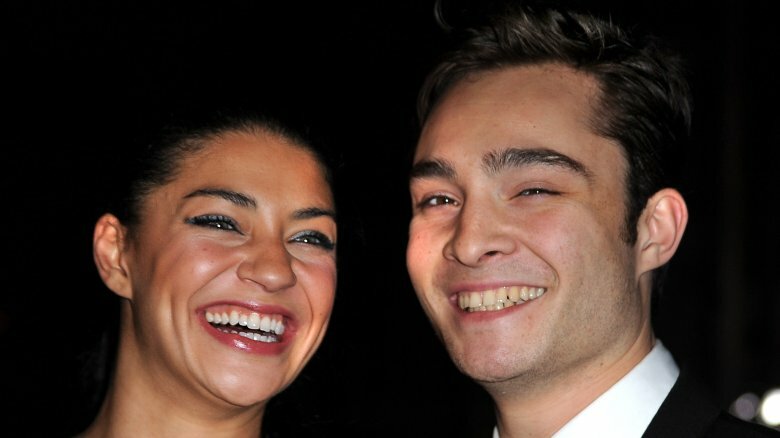 Ed Westwick's bad boy Chuck Bass occasionally hooked up with Jessica Szohr's Vanessa Abrams on Gossip Girl (2007-12), and the pair had an on-again-off-again relationship in real life, too, starting in 2008. A source told Page Six that ironically, it was gossip that led to their eventual split in 2010: Westwick dumped the brunette beauty after he heard through the grapevine that Szohr was allegedly getting flirty with one of his best friends. Gossip Girl queen bee Blair Waldorf, played by Leighton Meester, had a fling with college student and socialite Carter Baizen, played by Sebastian Stan. Though Baizen only appeared in 11 episodes of the series, Stan went on to date Meester in real life for two years, from 2010 to 2012. Us Weekly reported that the split was amicable. Meester is now happily married to Adam Brody, with whom she shares daughter Arlo. 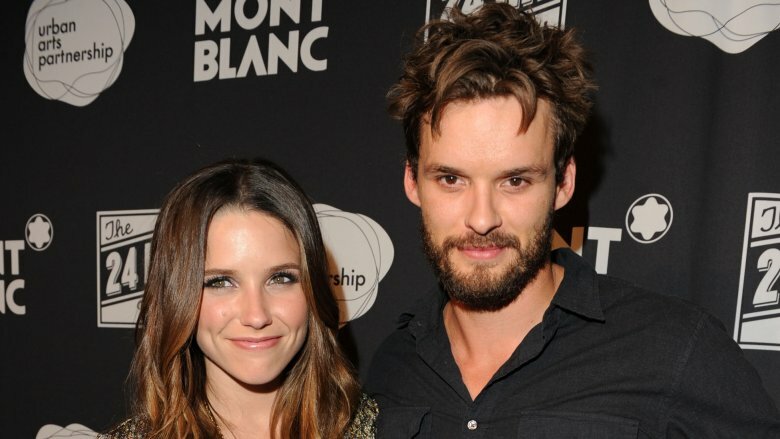 One Tree Hill star Sophia Bush moved on from one on-screen-off-screen love interest–Chad Michael Murray–to another, actor Austin Nichols, who plays on-screen husband Julian Baker on the series. The couple dated off-and-on for six years, Us Weekly reported, from 2006 to 2012. A source told the magazine that Bush simply "didn't think he was the one." Ouch. During an "off-again" period with Nichols in late 2008 to 2009, E! News reported that Bush dated another One Tree Hill love interest: James Lafferty, who played Nathan Scott on the show. Interestingly, it was her ex, Murray, who supposedly spilled the beans on her third in-house romance, explaining that he and Bush were amicable and professional on set because they'd each moved on: "She's got James, and James and I are friends," he said. 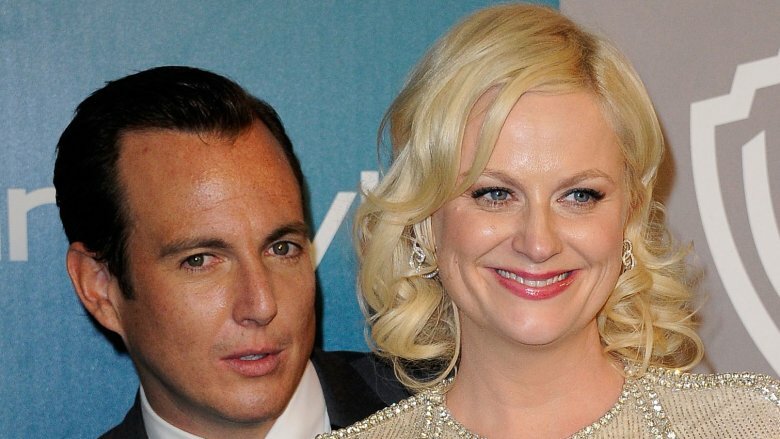 Amy Poehler and Will Arnett had already been married for seven years when he guest-starred on Parks and Recreation (2009-156) as MRI technician Chris, who was set up on a blind date with Poehler's Leslie Knope. The January 2010 episode, called "The Setup," had hilarious moments between the now-divorced pair, including Chris getting upset that Poehler directed "regular" parks instead of amusement parks. Unfortunately, their off-screen romance didn't have the happiest ending. The couple, who shares sons Archie and Abel, separated in 2012 and finalized the divorce in 2016. 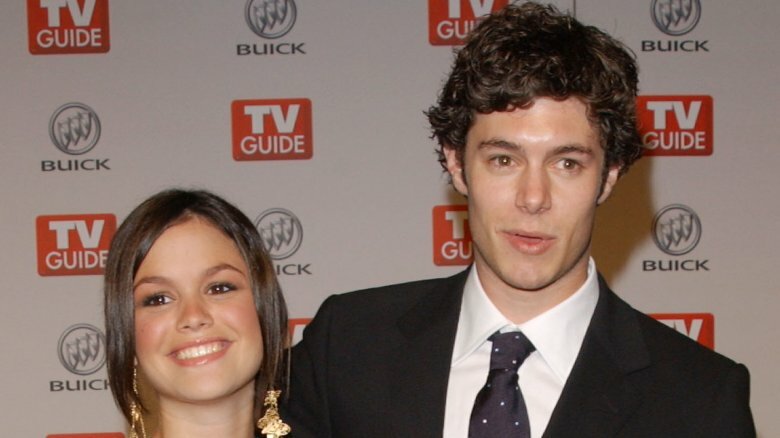 Adam Brody and Rachel Bilson were almost too cute as nerdy Seth Cohen and snobby Summer Roberts on The O.C. (2003-12). The on-screen couple eventually tied the knot, but despite being just as adorable in real life as they were on TV, People reported that Brody and Bilson split in 2006 after three years together. 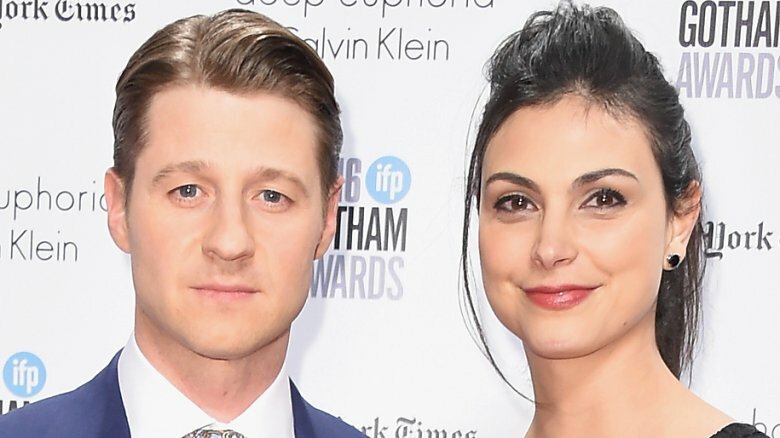 Ben McKenzie's Commissioner Jim Gordon has a complicated relationship with his on-screen former fiancée, Leslie Thompkins, played by Morena Baccarin, on Gotham (2014-). Their off-screen romance is adorable now, but it didn't start that way. Baccarin reportedly got pregnant with McKenzie's baby while she was still married to ex-husband Austin Chick. She and Chick have since divorced, and she and McKenzie are now married and share daughter Frances Laiz. Harry Hamlin and Lisa Rinna married in 1997 after dating for five years. They co-starred in Veronica Mars (2004-07) as Aaron and Lynn Echolls, the parents of the titular character's nemesis, Logan Echolls. 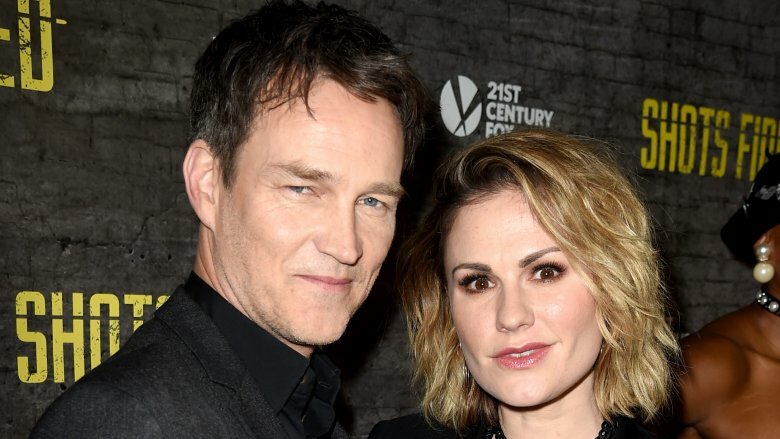 Thankfully, their real-life relationship has been much happier than their on-screen marriage, which was rife with abuse, addiction, infidelity, and ended with (spoiler alert!) Lynn's suicide. 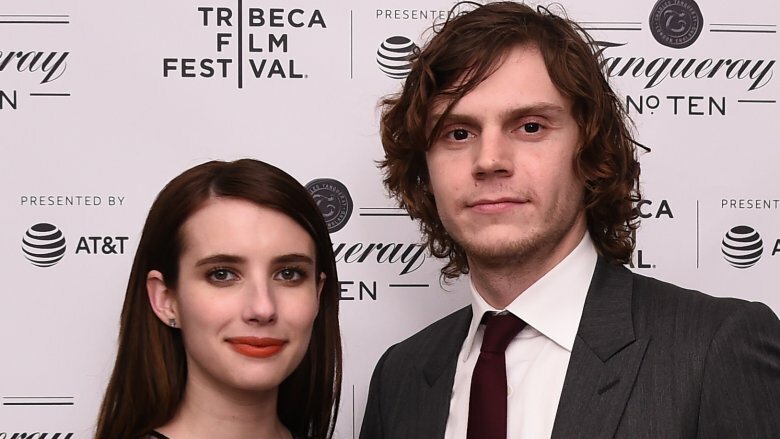 Emma Roberts starred as witch Madison Montgomery in American Horror Story: Coven in October 2013, and Evan Peters was her undead lover, Kyle. Fun fact: it wasn't their first on-screen romance on the show. Roberts' fraudulent fortune teller Maggie Esmerelda fell in love with Peters' "Lobster Boy" Jimmy Darling in American Horror Story: Freakshow in October 2014. For a while, Roberts and Peters' relationship was almost more dramatic off screen than on. In July 2013, TMZ reported that Roberts was arrested for domestic violence after an altercation left Peters with bite marks and a bloody nose. They had a series of breakups and makeups, including a rumored fling between Roberts and Hayden Christensen, but Us Weekly reported in October 2017 that Roberts and Peters are engaged and going strong. Anna Paquin and Stephen Moyer found love when starring as Sookie Stackhouse and Bill Compton in True Blood. Though Stackhouse and Compton's romance comes to a, well, bloody end, Paquin and Moyer went on to marry in 2010 and are parents to twins. Moyer told Watch What Happens Live with Andy Cohen in 2015 (via People): "We met screen testing for the show. We were both single at the time, and there was just this kind of spark… I didn't see her for three months, and she had gone from having dark hair to this beautiful blond, and I had gone from being blond to this dark vampire. By day three or four—oh, this is going to sound so syrupy—but I knew I wanted to spend the rest of my life with her. It was within seconds, really, and it just became a thing." 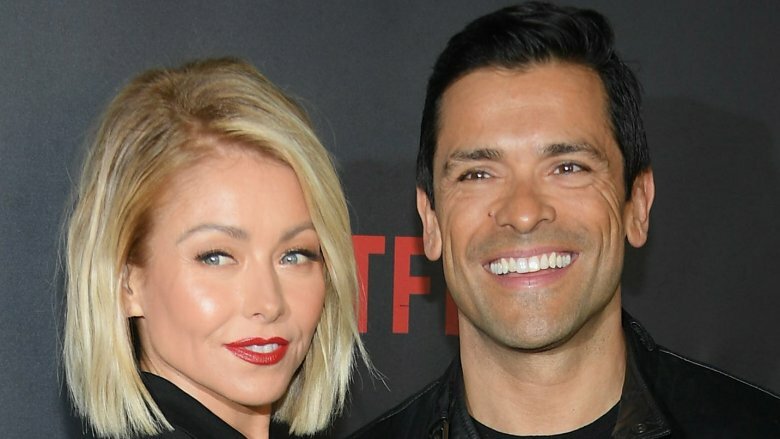 Kelly Ripa and Mark Consuelos stole hearts as ultimate soap opera couple Hayley Vaughan and Mateo Santos on All My Children (1970-2011). Their real-life marriage seems relatively drama-free and happy. They tied the knot on May 1, 1996, share two sons and a daughter, and have been pretty much #couplegoals ever since. 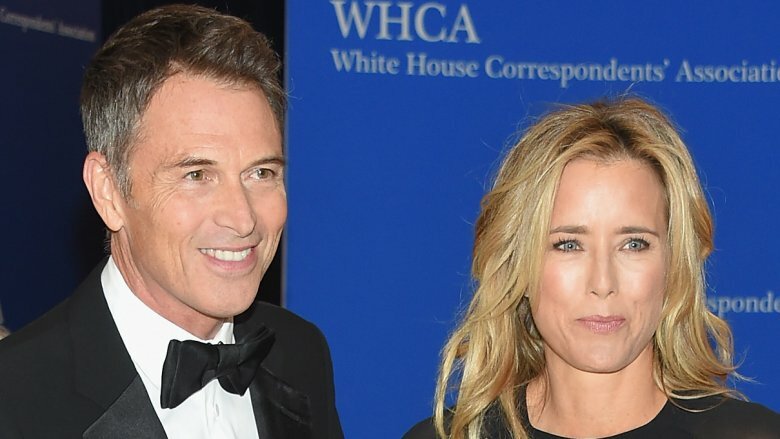 Madam Secretary (2014-) stars Tea Leoni and Tim Daly play a married couple on screen (Leoni's the titular Secretary of State Elizabeth McCord and Daly is her on-screen professor husband Henry). In April 2015, the co-stars went public as a real-life couple for the first time at the White House Correspondents' Dinner, People reported. Co-star Geoffrey Arend admitted the cast had heard rumors that Daly and Leoni were more than just colleagues, but noted, "Nobody really knew [they were dating]. You don't want to go to your boss and be like, 'Hey, so who are you dating?' So now I think we're all really protective."